Thursday night, just a few hours after securing a verbal from Quinn Cook, the defending Division I National Champions took on the defending Division II National Champions, Cal Poly Pomona, and came out on top by a score of 81-60. To see some of our coverage and commentary on the game, check out our live blog found here. Duke got off to a bit of a rough start but still led at halftime 39-33. The Broncos had their way in the paint in that half, actually outrebounding Duke 23-17. On the offensive end, the team was a bit sloppy, committing almost as many turnovers as assists (1 less). However, that’s exactly what these exhibition games are for: To shake off the cobwebs and get back in the swing of things. No disrespect to Cal Poly Pomona though. They came out ready to go. What a stand up guy this Kamansky fellow is! And apparently the excitement has only built in Pomona: the school is having a campus watch party at their student center. As I am currently abroad in Ireland and can’t watch the game in person, I will be liveblogging right here on Crazie-Talk. Feel free to join the fun using the console above. You can watch the game online at GoDuke.com for a $10 monthly subscription. 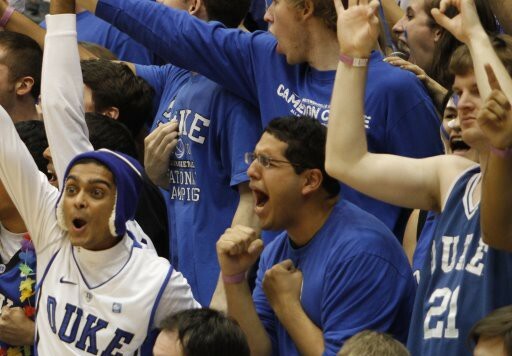 Several C-Ters will be in Cameron taking video of the game, so be sure to check the site frequently over the next few days for more highlights like this. Enjoy the game, and I hope to be chatting up a storm with hundreds of Duke fans champing at the bit for this season to start. See you right here at 5:45 PM EST.